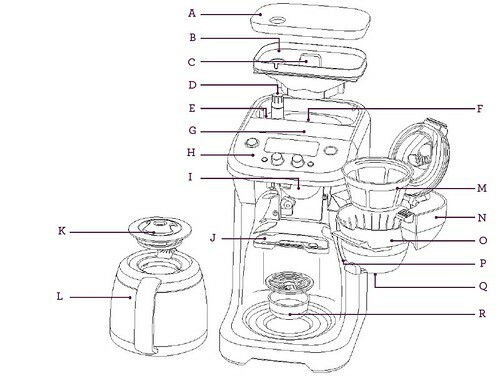 the Grind Control™ – The first household coffee maker with an adjustable grinder combined with a calibration function. The Grind Control™ allows you to customize your grind size and coffee volume to suit your taste. From whole bean to the perfect cup, in just a few minute and just exactly to your taste. A. - Bean Hopper Lid. B. Bean Hopper. C. Bean Hopper Locking System. D. Grind Adjustment Knob. E. Cleaning Brush. F. Adjustable Burr Grinder. G. 60 oz. Water Tank. 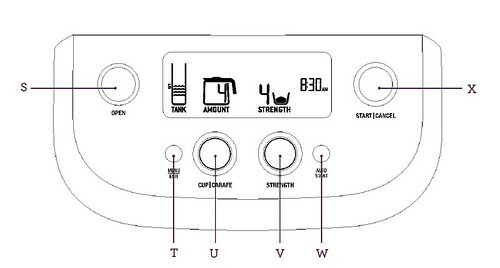 H. Control Panel. I. Grinds Chute. J. Grinds Catcher. K. Carafe Lid. L. Double-Wall Stainless Steel Thermal Carafe. M. Gold Tone Filter. N. Swing-Out Door. O. Removable Coffee Basket. P. Steam Baffle. Q. Brew Pause/Drip Stop. R. Drip Tray. S. OPEN Button. T. MENU/EXIT Button. U. CUP/CARAFE Button. V. STRENGTH Button. W. Auto Start Button. X. START/CANCEL Button.